Daisy and Graeme wanted a wedding with no rules and no traditions, just a great big celebration with their friends and family. Their relaxed London wedding took place in East London. Their inspiration was each other – no more and no less, they wanted only the things that they both like, and they got them. 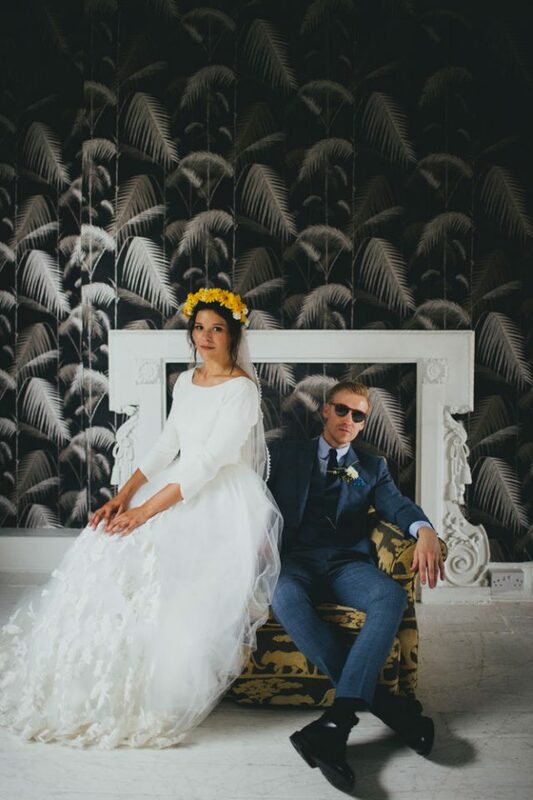 They were married at Stoke Newington Town Hall with their reception at The Roost in Dalston, which is already decked out in vintage props. This mean they didn’t need to do much else to the space. The couple DIYed place cards, colorful bunting and got some fairy lights for outside. The florals were kept simple, there were a lot of daisies as it’s the bride’s name and she chose yellow. The centerpieces were made by the bride: she took mason jars, wrapped them with some lace and string and put flowers inside. The bride wore a dress she’d fallen in love with online. She took the risk and ordered it from BHLDN, it’s a skirt and top combo: plain long sleeve top with a low back, and a big tulle skirt with embroidery going up the middle in a point. This look was inspired by Olivia Palermo’s wedding look. The bridesmaids were wearing ivory lace knee-length dresses, so the whole bridal party was in neutrals, which is a hot trend. The groom was wearing a slate blue suit with a blue shirt and a tie, he looked hot. Look at the ideas below and get inspired, there are a lot of awesome things to steal! The post Relaxed East London Wedding At The Roost appeared first on Weddingomania.